Aleksander Doskalchuk (L) outworked challenger Mikael Silander to earn a unanimous decision win. NAZRAN, Ingushetia, Russia (November 17, 2018) - The first and only M-1 Challenge flyweight champion, Aleksander Doskalchuk, made his second successful title defense last night in the M-1 Challenge 99, main event, when he decisioned his Finnish challenger, Mikael "Hulk" Silander, at Nazran in the Republic of Ingushetia in Russia. Silander (18-7-0), who had his second title shot last night versus Doskalchuk, lost in an Interim title fight against Ashimov last February at M-1 Challenge 87, in which the Finnish fighter was stopped on punches in the second round. In the co-featured event, Brazilian heavyweight Klidson Farias de Abreau (14-2-0) turned in an impressive M-1 debut, using a straight armbar to force his Russian foe, Anton "Cherepovets Giant" Vyazigin (11-3-0), into submission in the second round. Abreau usually fights in the light heavyweight division, but he took on heavyweight Vyazigin, who was coming off a no-contest fight against living legend Sergey Kharitonov. Russian featherweight prospect Abubkar Mestoev kept his undefeated record intact, improving to 7-0-0 with his unanimous decision triumph against Elias Alves "Junior Maranhao" Da Silva (21-8-0). Mestoev had been fighting in the lightweight division, but moved down because he felt his lack of height was a advantage, yet he was considerably shorter in this fight with Da Silva. In the Fight of the Night, Akexander Osetrov (5-0-1) won a three-round majority decision over Salem Evloev (4-1-0), who is the brother of M-1 Challenge bantamweight champion Movsar Evloev, who is rumored to be signing with the UFC. Salem was being touted as a successor to his brother in the not too distant future, but his first loss will certainly curtail his rise as a contender, and Osetrov has positioned himself for a future title shot. Also fighting on the main card, Brazilian lightweight Michel "Sassarito" Silva (21-7-1) employed a rarely used brabo choke to defeat previously undefeated Magomedkamil Malikov (6-1-0) in round two. The 6' 2" Silva has a distinct advantage as the tallest M-1 fighter in the lightweight division. On the undercard, Ukrainian middleweight Vadim Shabadash (8-3-0) locked in a rear naked choke on Russian Musa Pliev (2-1-0) for an opening round win, Kyrgyzstan featherweight Busurmankul Abdibait Uulu (11-2-1) took a three-round majority decision from Russian Zalimbeg Omarov (10-3-1), and Spanish featherweight Aridane Romero (8-1-0) was victorious over Russian Ahmadkhan Bokov (4-4-0) by way of a second-round submission via a triangle choke. Georgian welterweight Amiran Gogoladze (7-1-0) only needed 10-seconds to knock out Juho Valamaa (15-6-0) with a powerful punch. It was the shortest fight of the night as well as one of the quickest knockouts in M-1 history. 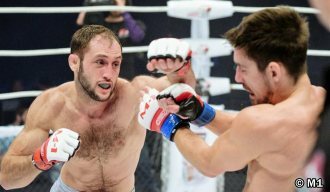 Russian middleweight Vladimir Trusov (3-1-0) defeated Russian Aslan Ismailov (2-1-0), by way of technical knockout in the third round, via submission to punches. On the pre-undercard, Russian featherweight Gleb Khabibullin (3-0-0) stopped Russian Amir Badiev (2-1-0) with a devastating punch in the first round, and veteran Russian lightweight Lom-Ali Nalgiev (15-7-0) decisioned Tursunbek Asylgaziev (10-7-0). The 24 fighters in this International event represented seven different countries: Ukraine, Finland, Brazil, Russia, Kyrgyzstan, Spain and Georgia.